This lip shine by C.O. 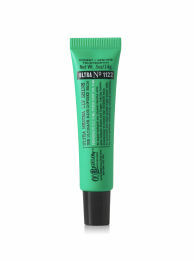 Bigelow is like a little mint candy for your lips. It has such a delightfully minty fresh flavor and smell that it's almost good enough to eat . . . and sometimes I'm tempted to do just that! Just the other day at work the guy that sits next to me actually said "stop eating your lip gloss!" while I was reapplying. Not that I was actually eating it. Although, the saleswoman at Bath and Body Works said you could use it as a breath freshener, so if you want squirt a little in your mouth go right ahead. I won't judge you for it!